Yep, What the hell happened to my brain? is the title of my first book about dementia. Some will wonder if anything happened at all, considering I have managed to write a book, but that’s ok, they and most people don’t see my daily struggles, the laminated signs around the house, or the many other disAbility supports and strategies I use. Dementia is after all, usually until much closer to the end, a disease with mostly invisible disAbilities. 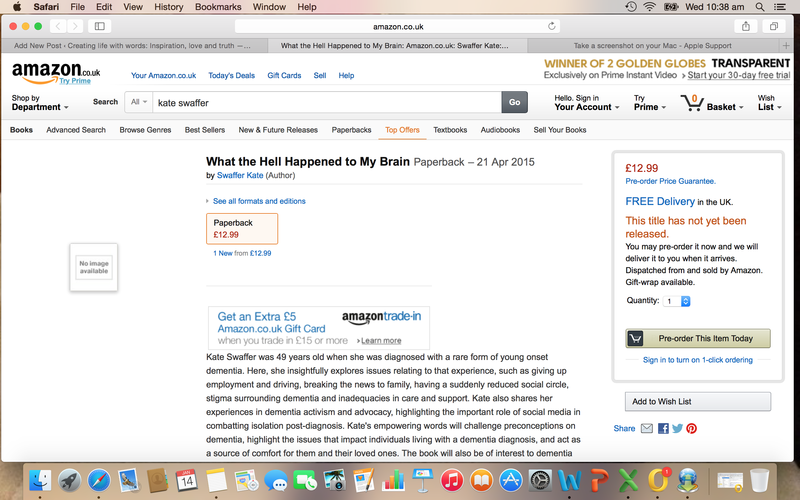 For those of you have asked, I don’t have a release date yet for the book, but discovered today it is already up on Amazon here and this is what it says about my book: Kate Swaffer was 49 years old when she was diagnosed with a rare form of young onset dementia. Here, she insightfully explores issues relating to that experience, such as giving up employment and driving, breaking the news to family, having a suddenly reduced social circle, stigma surrounding dementia and inadequacies in care and support. Kate also shares her experiences in dementia activism and advocacy, highlighting the important role of social media in combatting isolation post-diagnosis. Kate’s empowering words will challenge preconceptions on dementia, highlight the issues that impact individuals living with a dementia diagnosis, and act as a source of comfort for them and their loved ones. The book will also be of interest to dementia care professionals. It also says, This title has not yet been released. You may pre-order it now and we will deliver it to you when it arrives.Dispatched from and sold by Amazon. Of course, I will advise of a release date as soon as I have one. I’d have to say the emotional toll of writing this book has been significant, and that is on top of the huge physical effort of writing so much. My physical ailments like the parasthesia in my arms, is now constant in my right arm, almost to the point of an RSI injury, significantly limiting the strength and use of my arm. The emotional toll however, has been the most difficult, as living inside the denial bubble as we tend to do, has been impossible. I asked my dear husband this morning if he wanted to read the manuscript, and he said he’d prefer not to; we talked about it and said how we have both had to get out of the denial bubble, and seeing me out of it more, and struggling so much more due to over load and tiredness, is not pleasant for either of us. He also said, “no way, I’ll buy one, I don’t want any freebies!!! !” After my discussions and writings on there being big money in dementia, he is obviously rather wary… haha… Anyway, to say I am thrilled with it completed, and with the positive responses I have had so far, is an understatement, and although I am terrified of it finally being in print (! ), it is also very exciting. Thank you for your support here, and on twitter and Facebook. What the hell is happening to my brain? I have pre-ordered your book Kate and look forward to it arriving. I have no doubt it will be as honest and inspiring as you are. Keep us posted on the release date. YDUK will be giving it as much publicity as we can! Kate – many people who visit your blog have gotten to “know” you, but we don’t really “know” you because you never post about YOURSELF and how you’re going. This is the first blog post that I think you’ve mentioned you are dealing with challenges at home. We don’t see this, and the public don’t see it. They would think that dementia isn’t something too bad if you are a patient and you can do all of this. Because they don’t see the REAL face of dementia. And patients see everything you are achieving and may feel terrible that they aren’t doing everything that YOU’RE able to do …… know what I mean? I think so many people would love to see a few personal posts about what you are facing with the dementia disease itself. And any coping strategies. Take photos of the laminated signs ….. I for one would LOVE to see them ….. I do things like this around … if I didn’t have signs around on things I wouldn’t know what was on the pile ……. this is what you said ……..
Well done awesome friend! I am going to order a copy and look forward to reading it. Re: RSI – Don’t you think this may be your body telling you to take a break from all of this for a while. An exhausted Kate is not much use to herself let alone anyone else!! Just saying and this coming from Energiser Bunny!!! Lol!!! Hi Kate I have just been on line and it will be available on Amazon for £12.99 and can be pre ordered so I will do this . I must say where I live dementia is very much in the limelight. We have very good care and there are so many groups we even have a group for young people with dementia and it was definately needed. I totally agree with you, the book, and I am guessing even more so with the film, leaves so much out, and the focus continues to be in this type of medium the devastation and deficits. I’m involved in working on a documentary that is attempting to show people with dementia can live well, and that the myth of us all dribbling down our shirts is wrong! Thanks for your words too, always important to me. Just reading them few paragraphs Kate is as though you are writing about me. Everything you have gone through so have I but it does make you strong and gives you the determination to stand up and fight for all people with dementia. The amount of people who tell me I haven’t got alzheimers, I always say I know it’s the doctors who say I have but what do they know about it. I am looking forward to reading your book.